This item has a leadtime of 5 - 10 Days, we will contact you to arrange delivery once the item has arrived into stock. 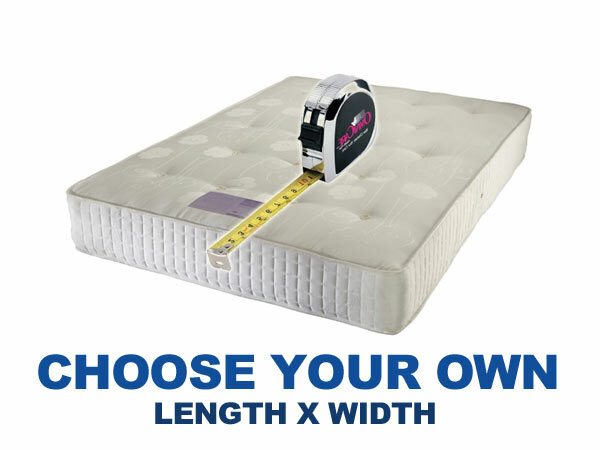 All of our custom made mattresses contain a quality open coil spring unit with generous layers of top quality luxury fillings to add extra comfort. Each mattress is hand tufted with a plain white belgium damask cover to give a crisp fresh look. Generous layers of white fibre, Polyester and felt give this mattress added comfort and support where needed. 13.5 gauge spring open coil system - Strong, knotted springs are linked together by a long coil spring. The spring feels flexible and offers a regular tension. Ideal for those appreciating a medium feel. * Please note this is a custom made product manufactured to your exact requirements, once ordered the right to cancel does not apply.